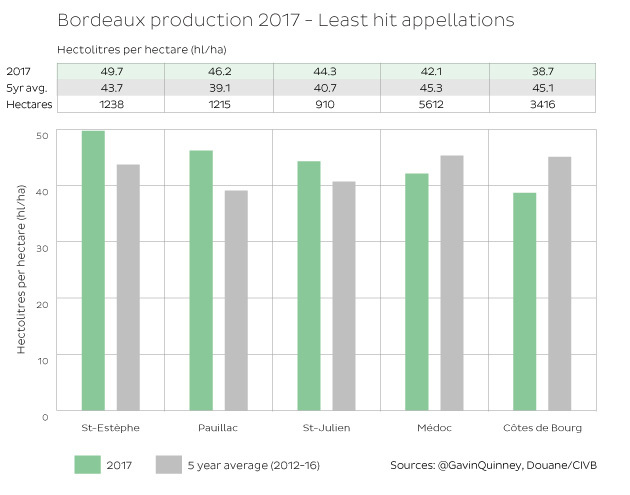 The 6,500 growers in Bordeaux had to submit their 2017 harvest declarations in December and the numbers have now been counted up. 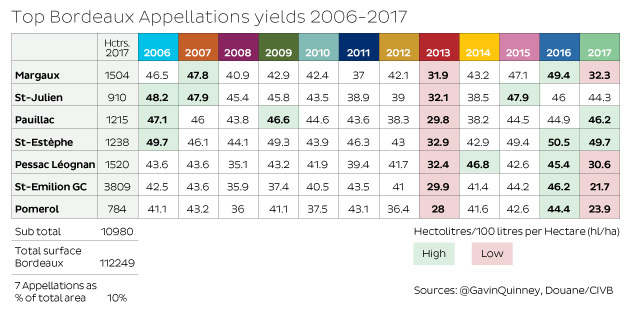 While Bordeaux enjoyed the largest crop for over a decade in 2016, 2017 was 40% down on the previous year and 33% lower than the 10-year average. And with Bordeaux, 40% is a lot of wine – the equivalent of over 300 million fewer bottles from one year to the next. They were the lucky ones. 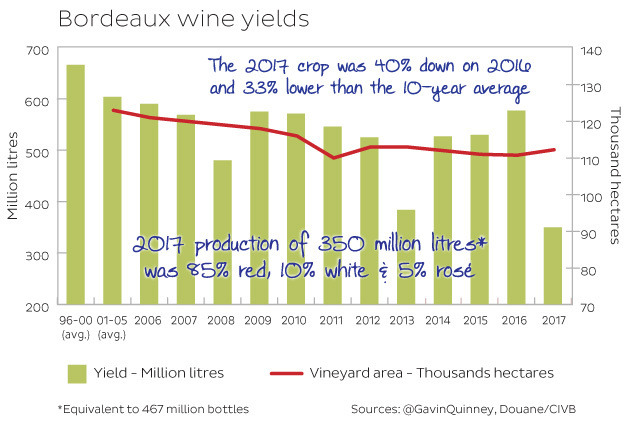 The Drinks Business magazine referred to my harvest report above as a ‘now annual deep-dive into the recent growing season and harvest across the Gironde’ (thanks, Rupert), so here I’ll plunge even further with a look at the production figures. As they say, the wines that are really in demand you can’t get hold of, and the wines that are available no one wants to buy. However, there are some delicious wines that are affordable – and available – which are certainly worth a punt. Steven Spurrier, the hugely respected writer and critic for Decanter who retired from judging the primeurs earlier this year, told me that he didn’t buy wines that cost more than £500 a case en primeur/in bond (ie excluding duty and VAT) because he didn’t have any friends who’d appreciate them. 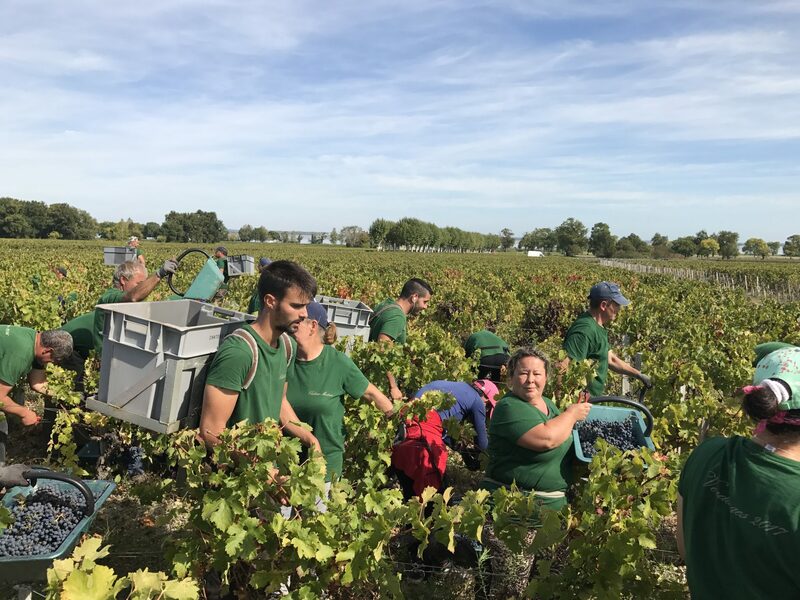 The Bordeaux 2016 ’en primeur’ machine marches relentlessly on. 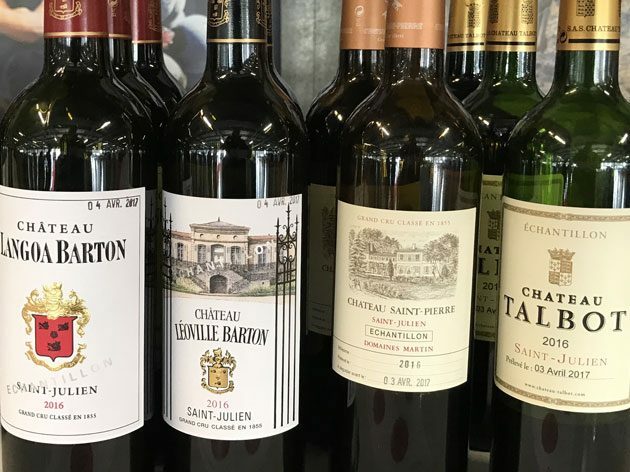 (Lordy, I’ve been to nine Chelsea matches since the official week of tastings began in Bordeaux at the start of April, and there’s still no end in sight.) 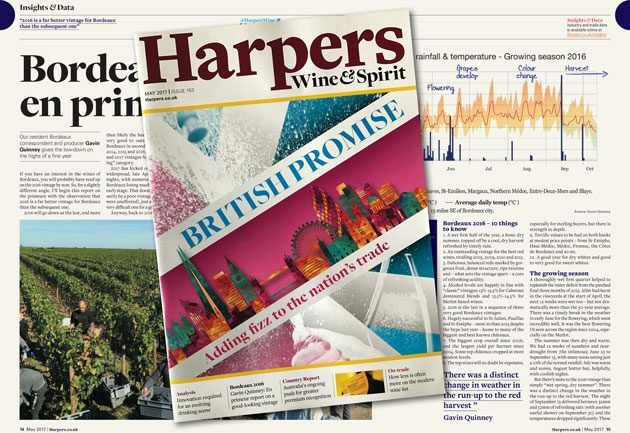 Here’s a link to a copy of my Bordeaux 2016 report for Harpers, the UK trade magazine, including my favourite 100 red wines. You can find many of my scores tabled alongside other critics on Liv-ex, the London International Vintners exchange, here. I can’t repeat the whole article here but here are some highlights. The extent of the damage from the frost at the end of April is now becoming clear. 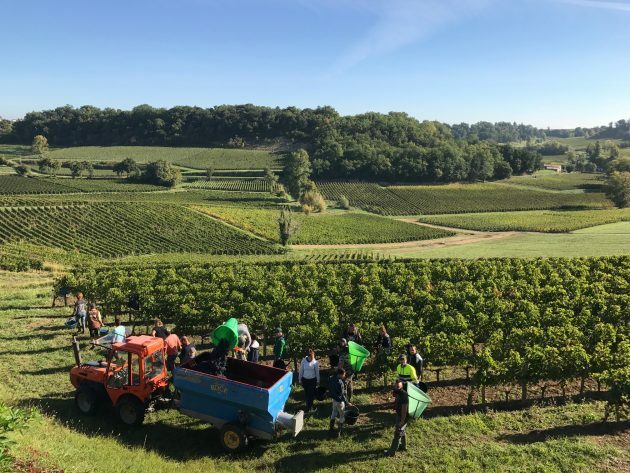 Following on from three really good, generous vintages – culminating in the biggest Bordeaux harvest for more than a decade in 2016 – we’ve been brought back to earth with a very significant bump. 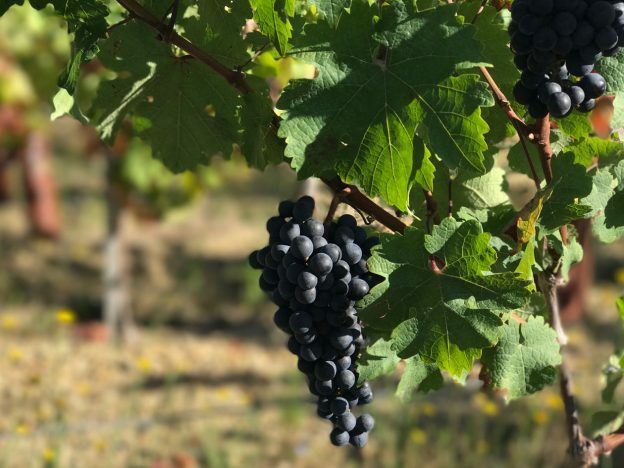 Freezing temperatures in the early hours of Thursday 27 April, and to a lesser extent the morning before, have wiped out the crop in many vineyards, right at the start of the growing season. ‘The Lord giveth…’ you might think. ‘C’est la nature’ a neighbour said, with a consoling shrug of the shoulders. Until last week, I don’t think I’ve ever taken the risk of Spring frosts that seriously. 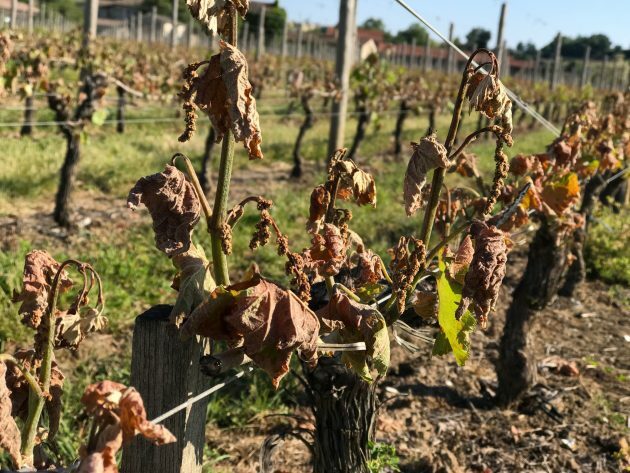 Really damaging frosts in Bordeaux are rare – the stuff of legends, such as the terrible one in April 1991, which almost killed off the harvest, and the even worse one in 1956, which killed off a lot of vines, notably on the Right Bank around St-Emilion. We did, though, have a warning at exactly the same time last year, when temperatures dropped to freezing before sunrise (on 29 April, here). 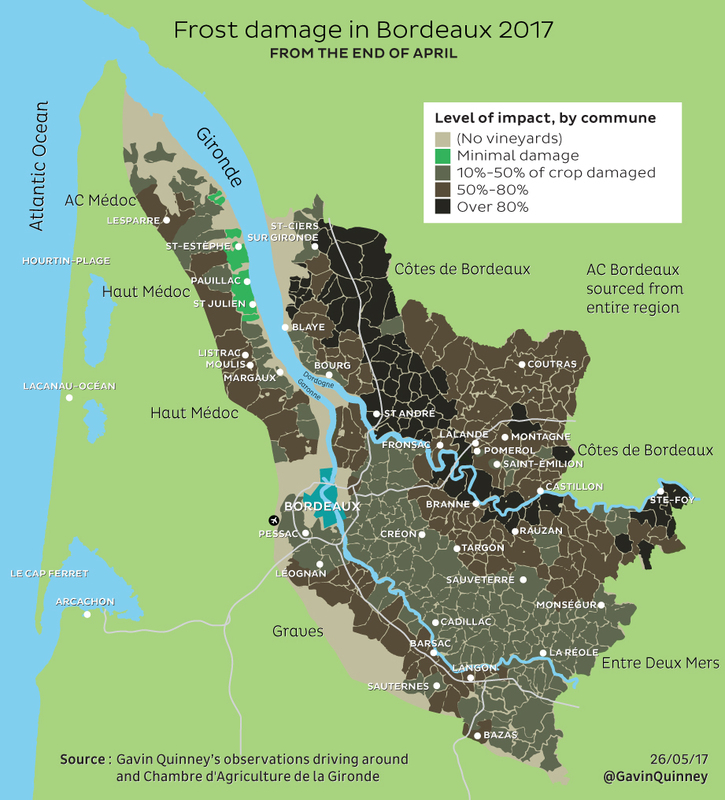 A few Bordeaux vineyards took a hit, but nothing compared to the losses in Champagne, Chablis and the Loire. Being based further south, I’m less of ‘G for Gel’ man than ‘G for Grêle’. As anyone who is familiar with our tales of woe, it’s the threat of hail that sends me into a nervous spin. We lost over half the crop in May 2009 and again in August 2013 to hail, so it’s understandable.